We have volunteer opportunities for everyone no matter your experience or schedule. Complete descriptions of the above can be found at http://www.philoptochos.org/outreach/commitments#saintbasil. These organizations support the Greek community here and abroad. If you know of an Orthodox Christian individual or a family in need, please refer them to the Metropolis of New Jersey Social Service Chair at 908-301-0500 or the National Philoptochos Social Services division at 212-977-7782. The Philoptochos is here to help. The Saint Andrew Philoptochos has always helped feed the hungry through food drives and hands on work in soup kitchens and homeless shelters in our area. In 2015, in response to the National Philoptochos Feeding the Hungry Initiative, our chapter led the charge at St. Andrew Church to buy, cook and serve over 100 hot meals each month at Faith Kitchen in Dover. We provide sandwiches for days the kitchen does not serve meals and we prepare and supply supplemental meals for when they are needed. Through financial support, the Philoptochos assists these ministries of Saint Andrew Church. Blankets, pillows, scarves and other items are lovingly made by our parishioners for individuals in hospitals, nursing homes, shelters and orphanages. 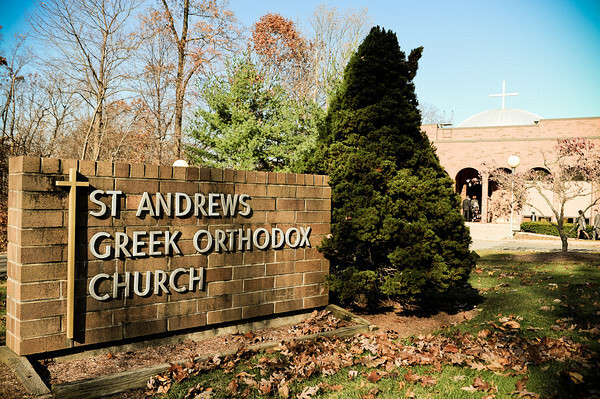 The members of the Saint Andrew Philoptochos actively engage in fundraising efforts needed to meet the financial needs of our philanthropic efforts. Each year we raise the thousands of dollars needed to support our local and national charities. Our major fundraiser is the Tricky Tray which is held in May. In 2016 Tricky Tray proceeds benefited The Family Promise of Morris County and Sussex County. In 2017, the Children's Medical Fund was the beneficiary. Another major fundraiser is the Rummage Sale held in our church gym each September.Proceeds support the purchase of materials and supplies needed by the knitting and pillow making ministries and a portion of the proceeds is also gifted to Saint Andrew Church to support other ministry efforts. Once a month we are generously supported by direct donations from our parishioners. The proceeds of these collections are put towards our chapter's monthly commitments to National Philoptochos charitable efforts. Community Christmas Card we print a yearly Christmas card using art created by our youth. Proceeds go directly to individuals and families in need in our community as determined in consultation with our parish Priest. Christmas and Easter bake sales our baking group and chapter members bake Greek specialties for sale within our community and to the public. Each year the St. Andrew Philoptochos invites graduating seniors to submit an application for scholarship consideration. To be considered for the scholarship award, please complete the attached application. We welcome your application and wish applicants success in their future endeavors. The Philoptochos is the 'Mother of the Church'.The Mother of the Year is an honor bestowed on a member of the Philoptochos who exemplifies the definition of "Mother" --caring, compassionate, and committed to improving the lives of her family and those around her. Mother of the Year is awarded on Mother's Day. This committee sends a card to lift someone's spirit in a time of need. If you know of anyone who is ill, has suffered a loss or needs a kind word, please let us know.